This week's homeschooling story is from Sarah Pellegrini. 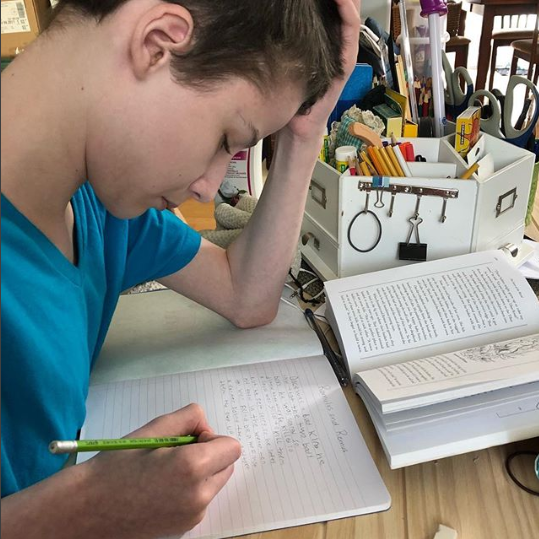 Read below to hear her story about how homeschooling was suggested as an alternative to public school for her son who was diagnosed with Dyslexia, ADHD, Sensory Processing Disorder, Anxiety and OCD and how it became the best option for their family. My name is Sarah Pellegrini. My husband and I have two children, a daughter, 19 and son, 12. We live in New Brunswick, Canada. We started our homeschooling journey in 2013. My son had been in the public school system when he was diagnosed with Dyslexia, ADHD, Sensory Processing Disorder, Anxiety and OCD. School was nightmare for him. His nervous system was completely overwhelmed in every way. We saw a tutor for his dyslexia 3 times a week, an occupational therapist for his sensory processing/ADHD once a week, and a child psychologist for his anxiety and OCD every two weeks. It was exhausting and it wasn’t working. Our paediatrician casually suggested homeschooling as an alternative. I went home and began researching homeschooling. My husband and I discussed it at length, and I also discussed it with my daughter who was about to enter high school. I didn’t want there to be any hard feelings since I wasn’t going to be homeschooling her. A month later we went down to the school district office and filled out the homeschool forms and haven’t looked back since. In the beginning I made every rookie homeschool mistake. ; I tried to recreate “school” at home, I bought curriculum without considering how my son learns or how I teach, and I tried to squeeze as many subjects as I could in our 3-4 hour school day. Being dyslexic myself, I often worried that I wasn’t capable of teaching. Even though I knew my son’s struggles firsthand, I was full of self doubt. The way we homeschool has evolved so much over the past few years. Hands on works best for both of us. We are both very visual so reading from a textbook doesn’t serve either of us well. Our favourite activities are nature walks, hands on science experiments, and smaller art projects. I tend to keep the lessons short, about 20 minutes and then my son does a drawing, painting, or craft to show me he understands what we have just studied. I limit our mornings to 3 subjects, and leave the afternoons for gym or art activities. In September 2017, we started our Instagram account as a way of documenting what we do everyday for family and friends but I quickly realized it also provided a sense of community that I had been missing. We live in a small town, there are no homeschool groups or co-op, being able to connect with other homeschool parents online has been such a positive experience. Homeschooling isn’t always easy, there are days I question my decision to homeschool, but the positive changes in my son have been incredible. He is able to handle things now we didn’t think were possible a few years ago. Education is such an individual thing. My daughter has said she doesn’t think homeschooling would have worked for her but for my son it was the best option. I am thankful that my children are able to get the education they both need.